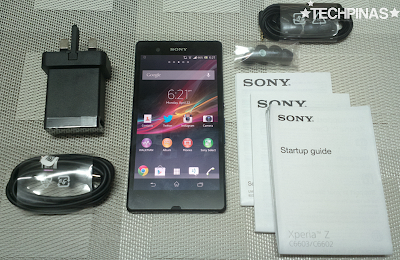 Sony Xperia Z Philippines Unboxing, Accessories Check : Water Resistant and Dust Proof Flagship Android Smarphone, Out Now At Kimstore! I got my Sony Xperia Z from Kimstore several days ago for only Php 23,400! As you all know, Kimstore is TechPinas' trusted online store. I know Kim Lato personally and if there's anything I can tell you about her, it's that her integrity and desire to serve her customers well are unquestionable. Like what I shared on TP a few months back, Sony Xperia Z is the legendary Japanese company's new flagship Android smartphone. As such, it bears all the best things - in terms of design, specifications, and value-added features - that Sony can possibly give consumers this year. Flaunting an eye-catching and extremely elegant glass-sandwich design, the slim and light Sony Xperia Z - running Android 4.1 Jelly Bean operating system - will mesmerize (if not floor) you at first sight. This gorgeous design is perfectly complemented by the handset's powerhouse innards highlighted by its Quad Core 1.5 GHz Krait processor, 2 GB of RAM, 16 GB of expandable internal storage, and Li-Ion 2330 mAh battery pack. Like what one would expect from a top-of-the-line smartphone by a legendary multimedia giant, Sony Xperia Z flaunts a stunning and ultra-crisp 5-inch Full HD display and features a 13.1 MegaPixel autofocus camera with back-illuminated sensor and LED flash, a 2.2 MegaPixel front-facing camera, and Full HD 1080p video recorder. Of course, consumers will also get Sony's very own Mobile Bravia Engine 2, which instantly enhances the quality of photos and videos for a better viewing experience. 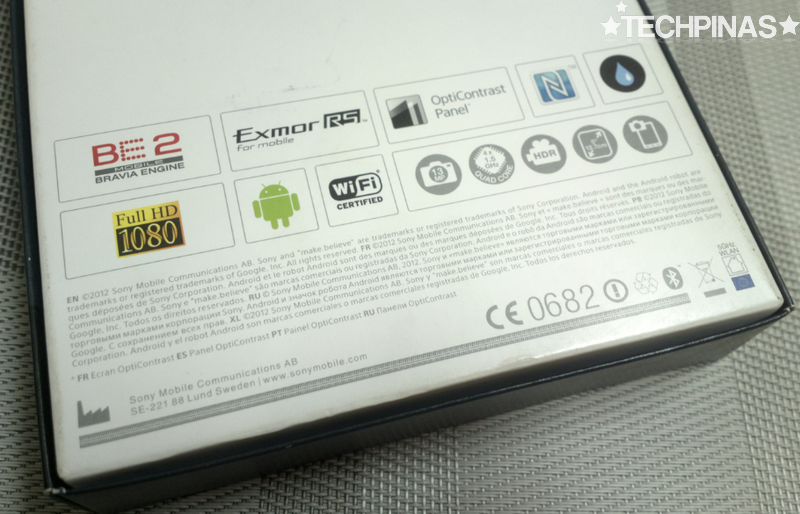 The package contains the unit itself, the charger, in-ear earphones with extra silicon buds, microUSB to USB connector cable, the user manual, and other documentation. As for connectivity, the handset supports WiFi, Bluetooth, 3G, and LTE. As I've explained earlier, LTE is the latest generation in mobile connection standards that's capable of delivering speeds of up to a whopping 100Mbps or around 42Mbps in the Philippines. Both Smart Communications and Globe Telecom have launched their LTE plans and Smart has even started offering the service via prepaid, which - I believe - you can use with Sony Xperia Z. But what truly sets Sony Xperia Z apart from its terrifying competitors - mainly the Samsung Galaxy S4 - is that it is IP57 certified. This means that the Z is dust-proof and water-proof even when submerged in a meter of water for up to 30 minutes. So if you're a power user who wants the best specifications on his daily smartphone but who also lives a very active, sporty lifestyle, Sony Xperia Z could very well be the ideal handset specifically for you. Did all that pique your interest? Well, watch my quick unboxing, features rundown, and hands-on video of the Japanese giant's newest flagship Android smartphone in the Philippines to see more of the device. 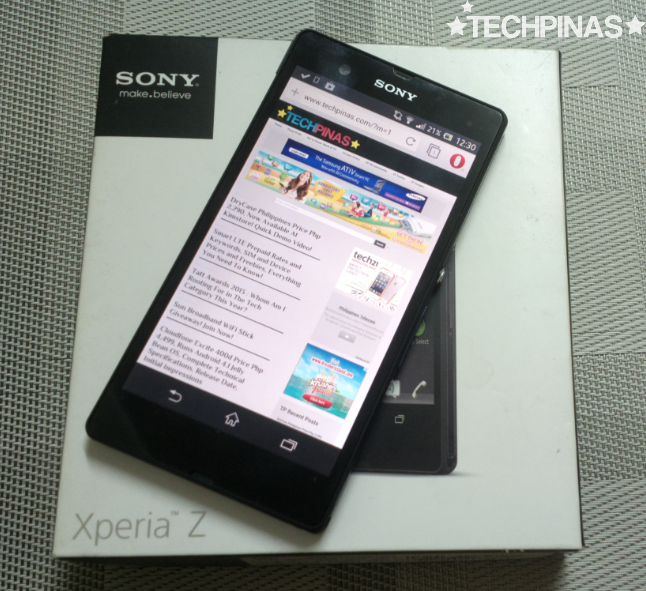 To learn more about the handset, kindly use our search bar and look for related articles; Sony Xperia Z is one of the most talked about handsets on TechPinas this 2013. Now, if you're already sure that you want to get this handset for yourself or a loved one, you can get in touch with Kimstore via their official Facebook page or their hotline numbers 09053201818 (Globe), 09228859799 (Sun), and 09088869799 (Smart). Just mention that you got the information from TechPinas; Who knows? Kim might even give you a small discount or a freebie if you do that.